Hi there and Happy Sunday to you! Sorry my post is running late today. I had internet problems this morning, which almost sent me into a tizzy. (Gasp!) I'm back online and ready to share my card for this week's challenge over at The Paper Players. The super-sweet, Nance Leedy is our "hostess with the most-est" for a fabulous theme challenge: Holiday Hoopla! This was a whole lot of fun, as the objective was to create a Christmas card using non-holiday stamps and non-traditional holiday colors. I decided to make a Christmas card for my Mom, who lives in Florida. (Mom, here is a "sneak peek" of what will be in your mailbox really soon!) I used a retired set, Tropical Party which was previously un-inked. I HAD to have it when it came out and just never found the motivation to use it. Has that ever happened to you? I created a little beach scene by sponging the sky with Pool Party ink and then tearing some Crumb Cake card stock to make "sand". Then I sponged the paper with Soft Suede ink and used the color Spritzer Tool to create little speckles. I felt like it needed a little sparkle (...shocking, I KNOW!) so I dressed up the edges with Dazzling Details. I colored different sizes of pearls with a marker to create the little ornaments. I decided, in the end, to only decorate one of the palm trees because both of them seemed like fa-la-la-la-over-kill. I'm not going to even talk about that triple twine bow. It took me entirely TOO long to get that thing situated and I'm still a wee bit bitter about it. I dressed up the button with a Glimmer Brad and right now, will probably never recreate that look again...unless I find myself with an extra hour and a half to kill. Lol! Wow! Love this sketch! Yes I have the same habit of purchasing something I must have only to store it away, and off to purchase the next thing I must have! 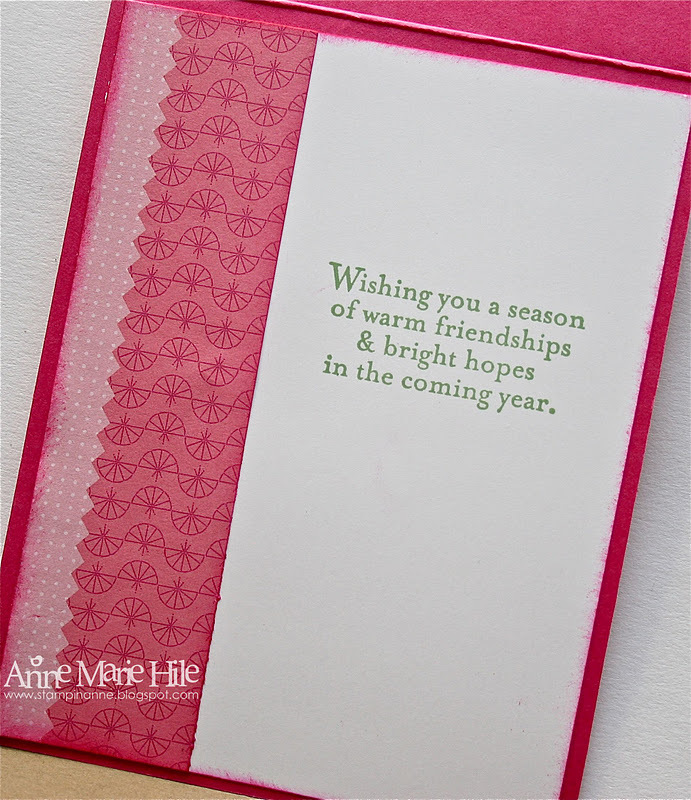 Cute little card here Anne! I'm shocked that you made a PINK card! :o) It is gorgeous and totally worth the wait! I love it and I bet your mom will as well. Yummy---it all looks like candy, good enough to eat! WOW!! This took some serious creativity!! LOVE, LOVE the color and detail on the card!! So when does our flight leave for our tropical holiday vacation? :C) Too cute!!! Amy L.
Gorgeous colours, gorgeous card and the effort on the twine was so worthwhile. 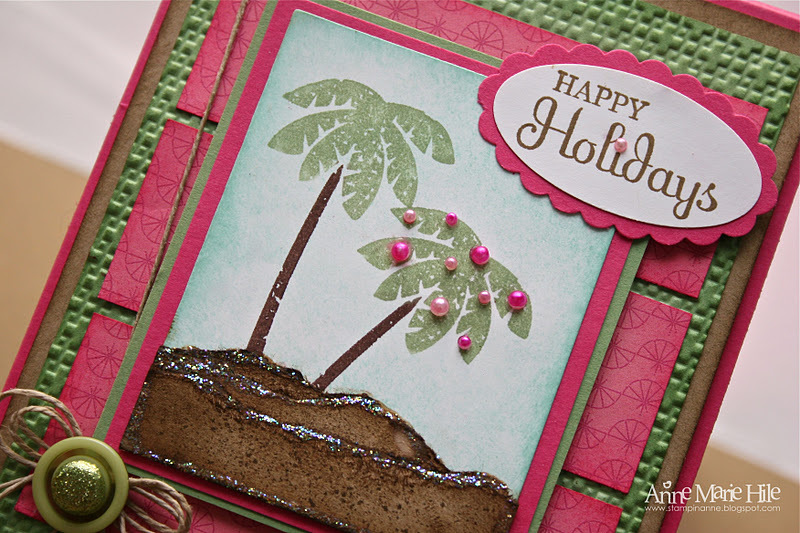 Love the embossing, and the decorated palm tree. Really great card! Have fun with the rest of your holiday decorating! Anne Marie... LOVE the Christmas palm trees! Such pretty non-traditional colors too. You and Nance are on the same wave length I think. So cute! Hugs. Love it!!! Living in FL, I think this is a perfect Christmas card! The colors, images, and palm tree bling are fab. I just may case this for my cards next year! So cute! Great job on the beach scene and I love the colors you used! lol about the cat in the tree!!! I think we are going to avoid putting up a tree this year, especially with Taz in the house!! love the card!!! 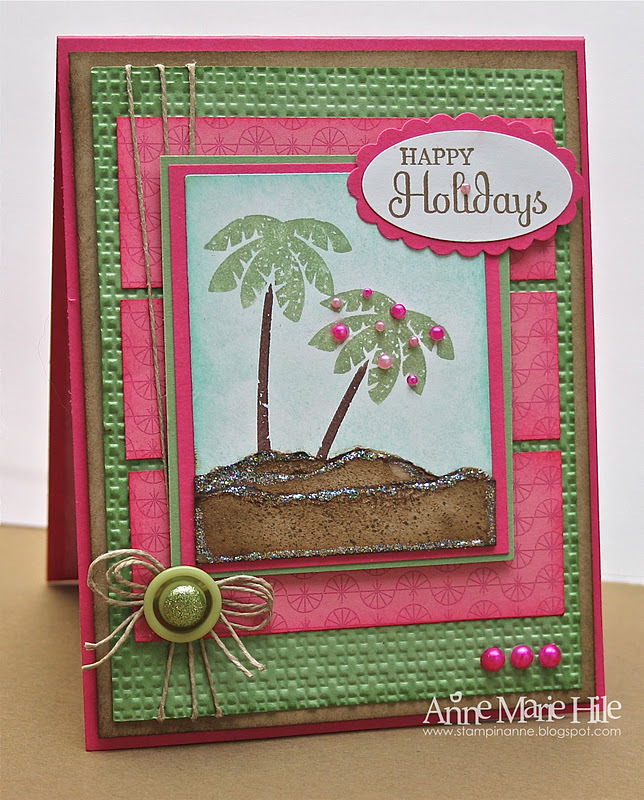 Those pink pearls on the palm tree are awesome!!! 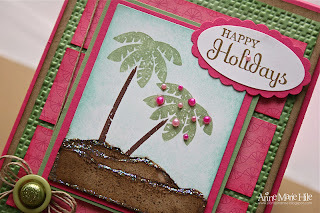 This is such a fun challenge and I love your card with the palm trees! Ahhhh southern living! OMG this is too cute! Love it. This is GREAT! I love everything about your card ... lucky Mom! The colors are awesome! This is just so over-the-top creative, Anne Marie! I LOVE these colors together, and of course, the pink pearls! Will be checking the mailbox for this beautiful card. Thanks. Love you!!! Beautiful card as always !! 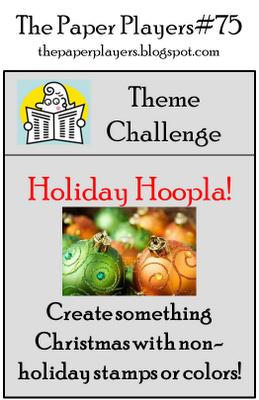 What a great way to use "florida" as your inspiration for this challenge. I'm sure your mom will just love your card! Awesome card AM...you rocked the challenge! Wish I could have Christmas with palm trees! LOL! Cute! I love the pearls on the palm tree. This is so fun! I have a niece who lives in Hawaii...thanks for the inspiration to do something different!